Memorial Day is one of those holidays that kind of sneak up on me. It comes so soon after Mother’s Day that I don’t usually think much about it until it is upon me. Ideally, I like to decorate for our picnic with nostalgic patriotic decor. However, since I never remember to do much planning for this holiday, more often than not, I have to pull together some last minute Memorial Day Decorations from things I have around the house. 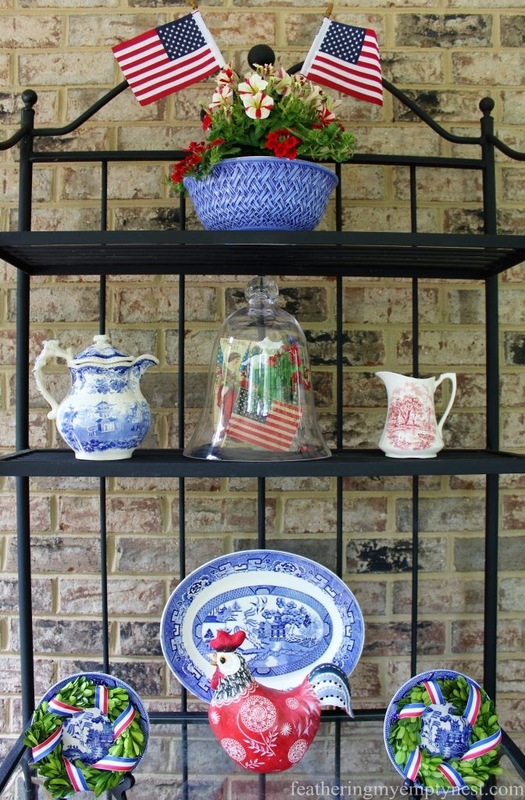 An old baker’s rack that used to provide additional shelving in the kitchen has been repurposed to serve as a decorative display piece on the screened porch. 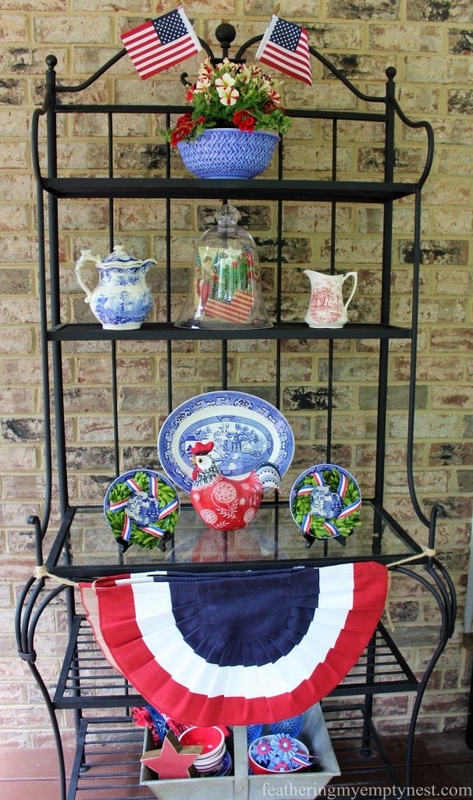 Because we like to entertain our guests on the screened porch, this year, I decided to make our outdoor baker’s rack the focal point of my Memorial Day decor. The first thing I did was to scour my cupboards and storage closets for red, white, and blue items I could use for decoration. Since my kids call me the crazy plate lady, it is not surprising that a lot of the things I found were dishware. Once I gathered all my foraged loot, I began to experiment with different groupings and configurations until I settled on a design I was satisfied with. On the top the baker’s rack, I used a blue basketweave mixing bowl from my kitchen. 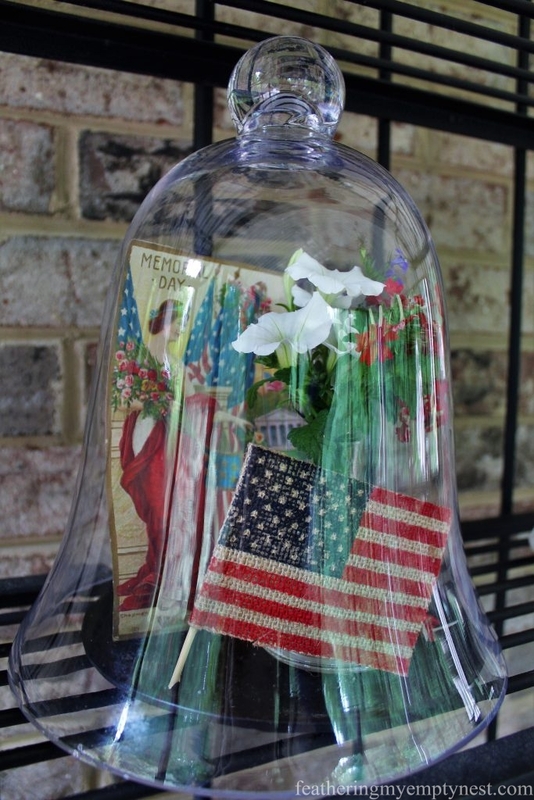 I filled it with red and white flowers and a pair of small American flags. I had plenty of room on the shelf for additional decor but chose to allow the single vessel to stand alone as a sort of festive topper for the shelves. 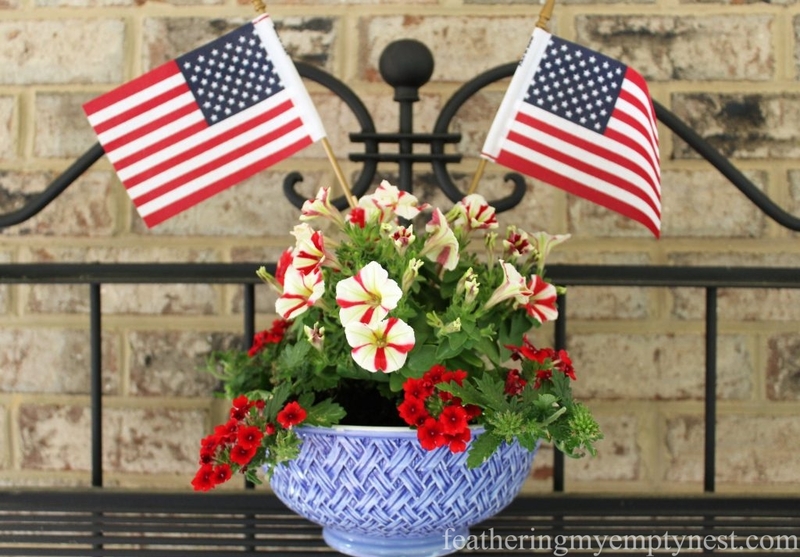 A blue basketweave mixing bowl serves as a patriotic planter. 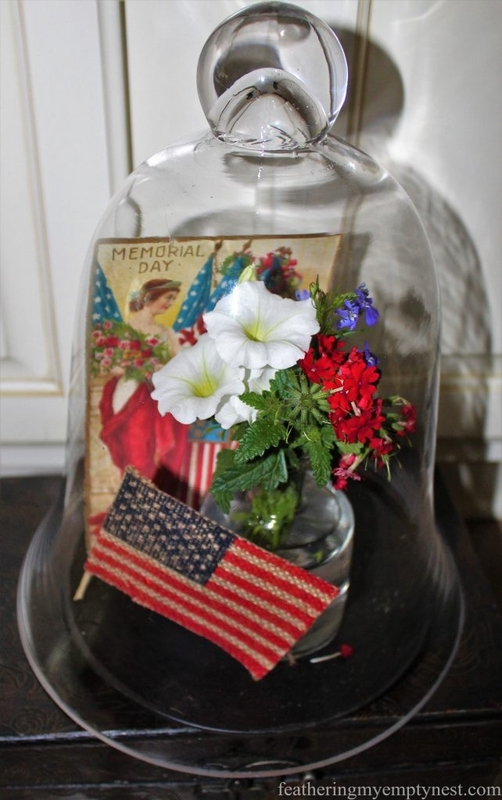 For the center of the second shelf, I created a Memorial Day vignette under a cloche. The arrangement under glass includes a Graphics Fairy image of a vintage postcard I printed on cardstock. It also holds a bud vase with flowers clipped from one of my outdoor planters and a small burlap flag. 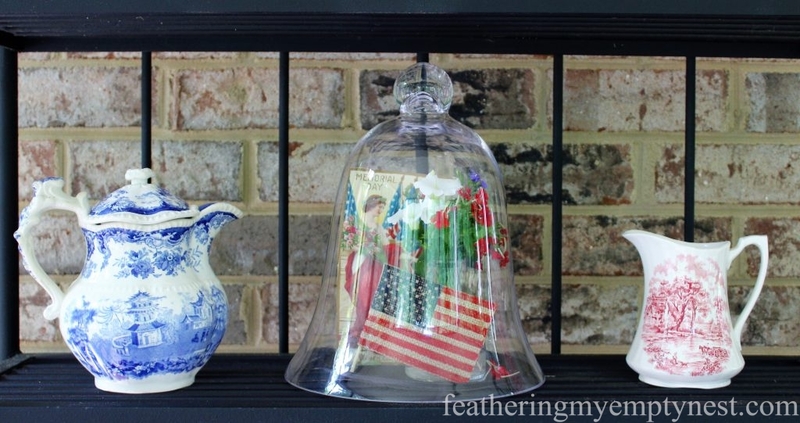 An image of a vintage postcard provides the backdrop for this patriotic vignette under a glass cloche. I then placed antique red and blue transferware pitchers, pilfered from my china closet, on either side of the cloche to add more vintage charm. Blue and red antique transferware pitchers add to the vintage feel of the display. 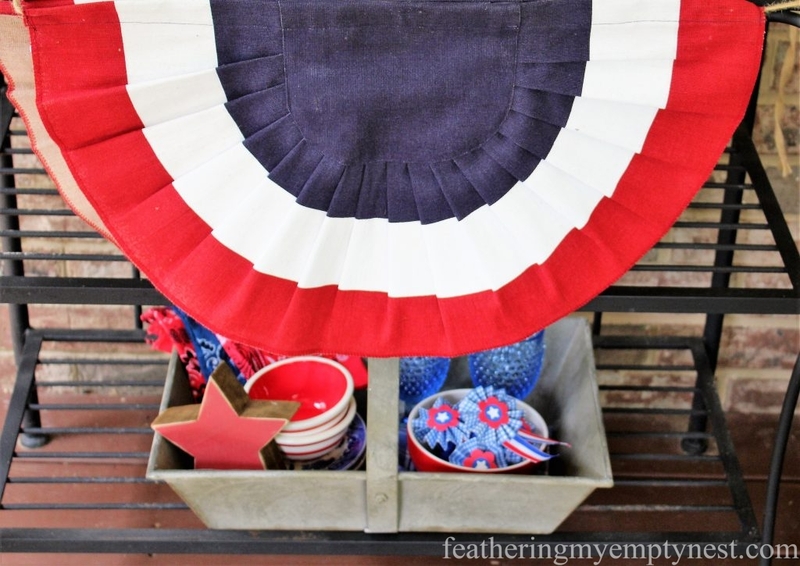 The patriotic bunting I’d purchased for last year’s 4th of July celebration seemed like the perfect addition to my vintage Memorial Day decor. I love bunting. It is such a charming old-fashioned decoration, evoking small-town parades with decorated bicycles and brigades of elderly veterans proudly squeezed into old uniforms. After I tied my beloved bunting to the edge of the center shelf of the baker’s rack, I took advantage of the flat glass surface of this one shelf to display more transferware. 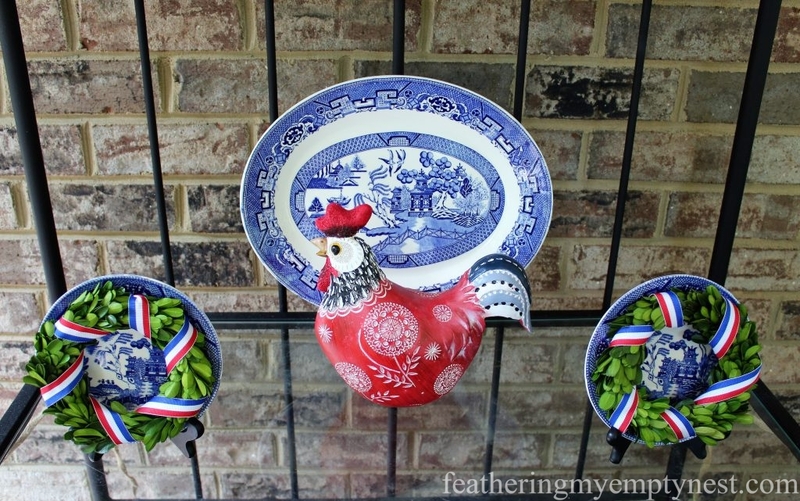 To make my display of Blue Willow china more patriotic, I placed a whimsical Americana rooster in front of the large platter. 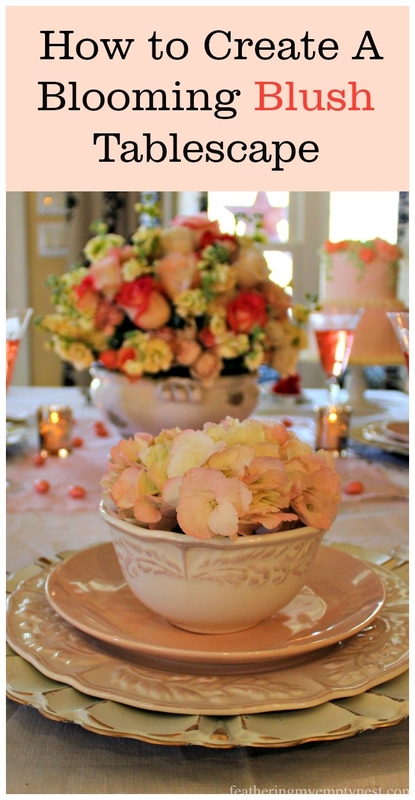 I also added, what I hope, looks like, memorial garlands to the stands of bread and butter plates. 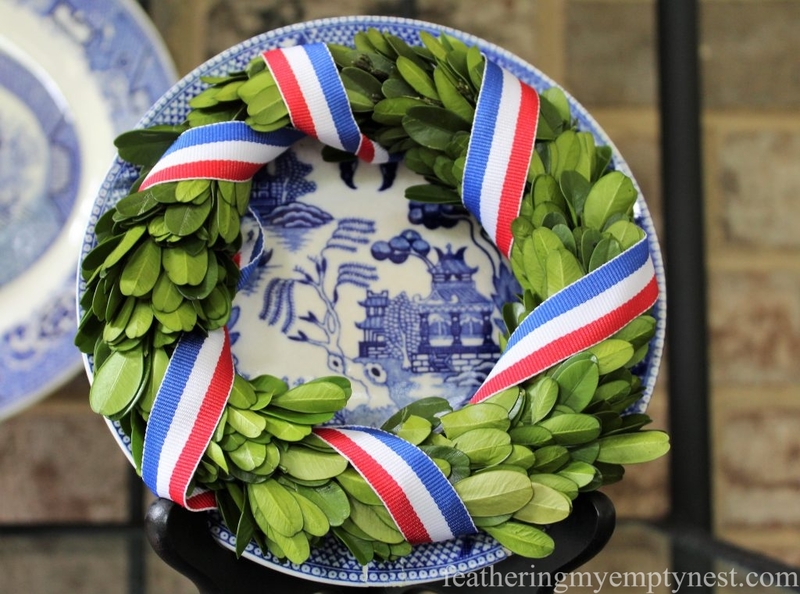 I made the “garlands” by simply wrapping red, white, and blue ribbon around small preserved boxwood wreaths. Blue Willow china is decked out for Memorial Day with the addition of an Americana Rooster and a couple of memorial wreaths. Since the hanging bunting covers the next shelf down, there was no need to place anything on that shelf at all. What’s easier than that? The bottom rung holds a galvanized metal basket filled with more red, white, and blue tableware for our Memorial Day picnic. 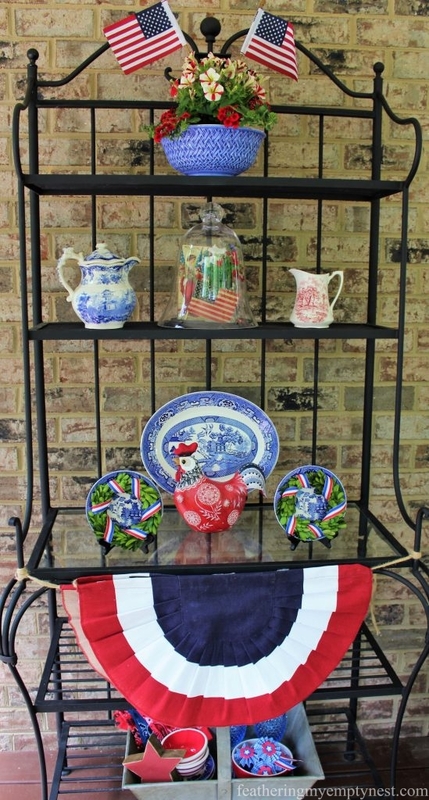 These items include blue hobnail goblets, Blue Willow plates, red and white striped bowls, red and blue bandanas I use for napkins, and a small red mixing bowl filled with DIY patriotic napkin rings. A basket full of red, white, and blue dishware is decorative as well as useful for a Memorial Day picnic. It took me very little time and effort to scrounge around my house to locate these items and then to put them together in a decorative display. 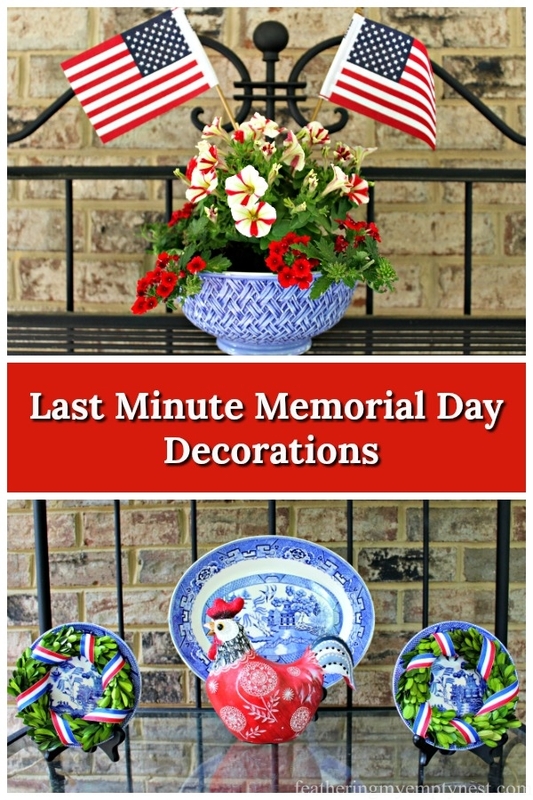 So, if like me, you are facing Memorial Day without a plan, you can easily create a festive environment for your celebration with just a few red, white, and blue items collected from around your home. 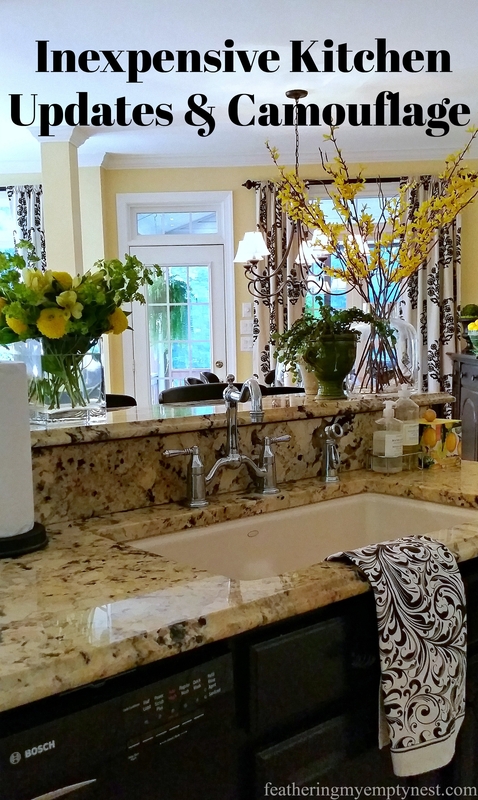 Patriotic decorating for Memorial Day makes it a little easier to remember, while we are enjoying our family, friends, hot dogs, and hamburgers, to spend a little time thinking about and being grateful for the sacrifice our fallen soldiers. Thank you so much for your kind comment. I hope you and your family have a lovely Memorial Day celebration. I love all of your patriotic decor! So charming. Thank you for sharing at Project Inspired. Thanks, Mary Beth, for your kind comment I really appreciate it! Beautiful patriotic displays! Thanks for sharing at Best of the Weekend! Thanks so much for your kind comment, Katherine. I hope you had a nice Memorial Day!